I love my Taichi, let's get that out of the way. ASROCK nailed it with the design, the support, the BIOS (although there are some things here and there that make me groan a bit). I realize that Realtek makes the drivers, but I can help but notice the amp setting was removed from the latest driver, and that's a bit disappointing. I don't know if it was a flaw in the impedance sensing design, or the CODEC not controlling the external amp as intended, and I can find documentation on this ALC 1220 chip, so that can't answer me either. Basically, is this feature ever going to be fully supported? Has anyone tested it to see if it appears to be working at all? I'm asking now, after months of ownership, because I am getting the MassdropxHifiman HE4XX and need to know if I have to purchase an external amp. My current audio gear is all doing OK with the ALC1220's output. I'm not certain what exactly the problem or situation is with the new driver version. I have a different ASRock board with the Realtek 1220 and TI NE5532 headset chip, which has the Realtek 8051 driver version on the download page. When you said the "amp setting", exactly what do you mean by that? Just the impedance matching feature, or something else? Or what exactly is the problem? The Massdrop headphones you mentioned are low impedance 'phones (35 Ohms), which is the current trend, and usually it is the high impedance headphones that have volume level problems with PC audio outputs. OTOH, planar magnetic drivers tend to be current hungry devices, and the impedance rating is just a single general rating. The impedance varies at different frequencies, just like loudspeakers. Low impedance means high current usage normally, but cheap headphones (NOT what you plan on using) are simple dynamic types that are easy to drive. If you are really into audio, which you seem to be, consider what your mother board costs compared to a headphone amp. Even if a headphone amp had a one chip amplifier, it still would have a dedicated power supply. I've often wondered why mother board audio chips would need impedance sensing software, when that is unheard of in audio equipment. While the NE5532 chip may be "high end" on a PC mother board, it is not legendary in high end audio products, a very standard, nothing special device in that world. IMO PC audio is a nice little add on to a mother board, but how good can it be? I use the S/PDIF output from the board into an external DAC, and its output into a real amplifier, driving speakers. Realtek controls their chips and drivers, and how much influence a mother board manufacture can have over their drivers, I don't know, but it is likely not much if any, at least in the short term. Parsec hit the nail on the head. Motherboard audio, while often used as a marketing tool, is nothing special. When a board touts "exceptional" audio or other positive descriptions it is always in comparison to other motherboard audio, never dedicated audio hardware. Motherboard audio is more than adequate for most people but even the best implementations are not up to snuff for professional audio work. All motherboard manufacturers use 3rd party audio components, typically Realtek these days, and these are supported by the 3rd party. The manufacturer does not create the drivers or maintain them, that is the job of the 3rd party supplier. In some situations the drivers are modified by a manufacturer but this is almost always just aesthetic branding not actual feature tweaks, if anything these drivers are often stripped down and less featured. Currently working to repair all band pass,Realtek or Asrock did screw up on this part.Planning to give "a value" to bass management for subs,250Hz for low to mid,250Hz-4KHz for mid low to mid high and beyond 4KHz for high.In the mean time my friend also help me to working on "headphone amplifier" supporting all the way up to 600Ω. I don't have any analogue headphones to really test this out with. I use a USB headset for games and skype and after a little EQ it's acceptable. 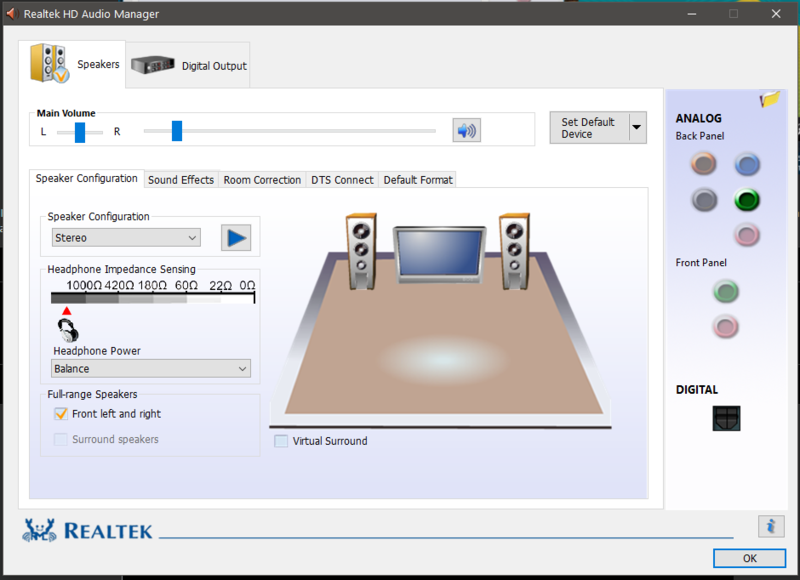 If you set the Realtek software to treat the onboard as Stereo, you'll get an impedance slider. How much affect it actually has is up to someone to try. It's a fairly low resource EQ, that does offer some reasonable sound sculpting to fix deficiencies in a muffled pair of cans. It's also quite good for boosting the headset mic gain and tweaking the EQ to make my voice clearer. Works with all things like Skype etc, anything using DirectSound. WASAPI and ASIO will bypass it, as will turning off the enhancement option (ticking disable) in the Windows sound > device > advanced tab. X370 TaiChi | 1700X P3.10 stock clocks | (2x 16GB) 32GB FlareX 2400MHz.